Check out 17 beautiful ideas for traditional dressing. This Teej, take a pick from these Indian outfits that represent the spirit of festivities! The festivities of Teej are in full-swing. Mehndi clad hands and feet, beautiful Indian hairstyle decorated with monsoon flowers, an equally dressy nail art design that compliments the bright makeup. You can go for shimmery golden eye makeup with a dark shade lipstick that looks super-festive or perhaps go for a no-makeup look, subtle hues and shades of lips, mascara, kajal and beige/brown eye shadow with a rosy blush. All of this depends on your attire. So, today, Zuri brings to you 17 traditional yet stylish Indian outfits. Choose from any one of these ideas and style yourself accordingly on the day of Teej. Lush green surroundings thanks to the monsoon shower, the verandah/lawn/garden come alive on this day. Ladies (especially new brides) sing songs and take turns on the decorated swings (jhoolas) created for this festival. The Teej festivities during the month of Shravana (July-August) are considered to be auspicious. Dressing up is usually an affair to remember. Newly married women either stick to their bridal lehenga or opt for yellow and green color. These shades are the symbol of fertility and they are generally considered favorable. Most women I have seen around usually dress in green. But times are changing and so is one’s preferred style. So, this Teej, go for something more unique, maybe an Anarkali suit or a designer Pakistani salwar kameez. Better still, you can also try a lehenga choli that represents Indian traditions at its best. You can also choose to wear a traditional saree, perhaps drape it in a stylish way. Infact, for a glamorous look, try out sarees or traditional suits with monsoon-inspired motifs such as peacocks, water drops, rainbow, etc. 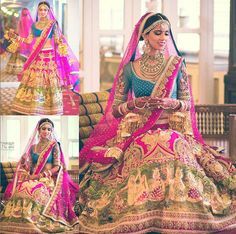 1.Go for a super bright, multicolored lehenga in contrasting colors to set that fun, Indian Spirit alive. You can even make the skirt in crinkled fabric with lots of layers! 2. Not into Lehengas? Then its gorgeous Pakistani style suit for you. Team it up with a wide legged pants called Pallazos. The pallazos let the mehendi go on your feet without a hassle as they are not tight around your ankle (unlike churidaar pajami). The flowy pakistani silhouette lets you move around, enjoy yourself on a swing and dance. 3. Something that sticks to Indian traditions yet has a bit of a twist to it – a tiny blouse, and a skirt with a long slit. A moderately embroidered blouse paired with a nice skirt. You can keep the skirt straight if you don’t want the ultra-flarey look. We wouldn’t recommend this for a newly-married bride. She must opt for something heavy, more embellished! As for me, I am going to be wearing a traditional South Indian silk saree that was passed on from my grandmother to me. A golden pearl necklace, red big bindi and glass bangles to complete the look.